The corporate landlords that have snatched up hundreds of thousands of homes in the wake of the foreclosure crisis have turned the American Dream into a “nightmare,” according to a report released by three activist groups. The report claims companies that own and operate rental homes — such as Invitation Homes, American Homes 4 Rent and Tricon often mistreat and overcharge tenants — due to a profit-driven investment strategy that dilutes the traditional relationship between landlord and tenant. The allegations are not new, but the report stands out for its level of detail and activist agenda, putting human faces on alleged misdeeds and recommending policies such instituting rent control and “speculator’s fees.” The report was jointly produced by the Alliance of Californians for Community Empowerment (ACCE), Americans for Financial Reform and Public Advocates Inc.
Wall Street-backed real estate investment firms began gobbling up single-family homes at depressed prices during the foreclosure crisis and converted them into single-family rentals. Source: “Wall Street Landlords turn American Dream into a Nightmare” report by Alliance of Californians for Community Empowerment, Americans for Financial Reform and Public Advocates Inc.
That helped kickstart the recovery while providing many Americans a chance to live in homes with ample space in desirable neighborhoods. “During the housing crisis there was a glut of distressed inventory that desperately needed capital for renovation and repositioning, and this was not forthcoming from individual investors who were worried about catching a falling knife,” said Gary Beasley, former co-CEO of Starwood Waypoint Residential Trust (which merged with Colony American Homes to create Colony Starwood Homes, the investor mentioned most often in the activist report). “These institutions stepped into that role and often turned the worst homes in the neighborhood into some of the best,” added Beasley, who is now CEO of hot real estate tech startup Roofstock. But the companies soon came under fire for allegedly neglecting many of their units, jacking up rents, charging unfair fees, and ruthlessly enforcing eviction policies. 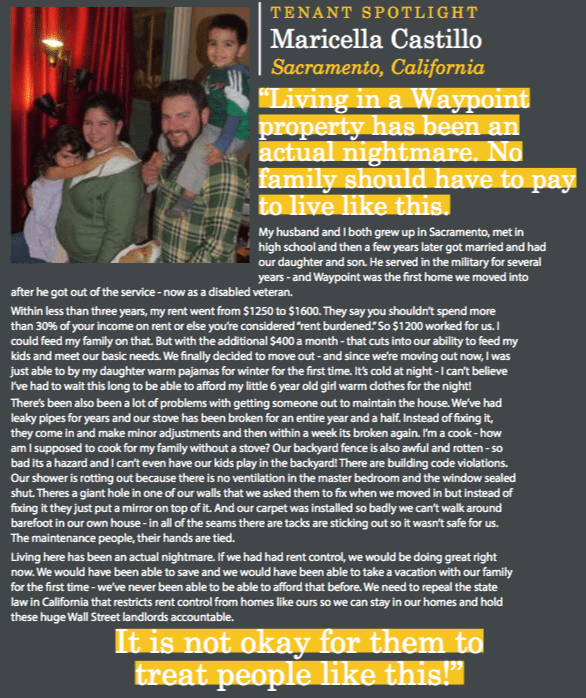 In one case, an elderly tenant who lived in a home owned by Starwood Waypoint Homes (recently merged with Invitation Homes) was charged a $100 late fee for owing $40 on her rent, even after she explained that she could pay the $40 when she received her social security check on the third of the month, according to the report. The study also cited data suggesting that corporate landlords are increasing rents and evicting tenants more than mom-and-pop landlords. 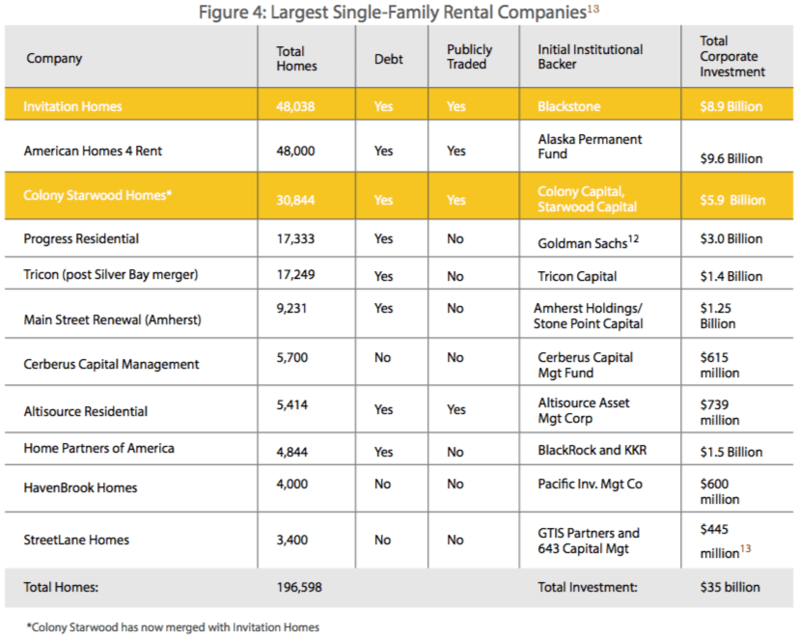 The alleged mistreatment of tenants by single-family rental giants stems from their tendency to automate and centralize property management so as to maximize income for investors, who may own stock in the corporate landlords or bonds collateralized by their rental units, according to the report. Establishing “right of first refusal” policy that entitles tenants to the first chance to buy their home when its available for sale and the second chance to non-profits or public agencies.